Jase Jergensmeyer was the bully that tortured me growing up–the kind of boy who would pull my pigtails and call me names in elementary school. He was never supposed to be anything other than a menace. He wasn’t meant to be anything other than the definition of what I didn’t want. Things don’t always happen the way we plan, and sometimes we ask God why he puts things in our path, but the most important thing to remember is: Life is an adventure, and if we all knew how it would play out, we never really would be living, would we? I COULD NOT WAIT for Shelby’s story! I loved her as the little girl in Let It Be Me and Let It Be Us, so when I heard that Barb was writing In Your Eyes, I was more then excited. 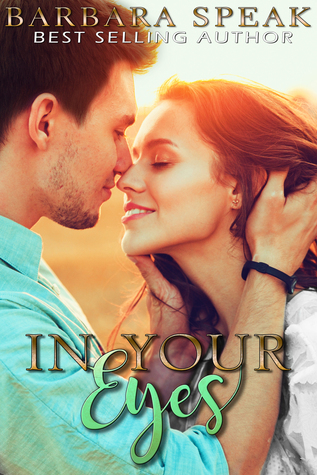 In Your Eyes is the story of good girl Shelby and Jase, the boy she loves to hate. There are many ups and downs to their story, causing me to laugh, cry, sigh, and hurt, but ultimately, to love the h*ll out of it. I adored that fact that Barb didn’t completely change Shelby in growing up, just matured her into a older version of the sweet girl that I thoroughly enjoyed before. Canyon and Ari also make up a good part of the book, but as secondary characters. Frankly, it would not have been the same without them. I love how their relationship has matured and changed for the better, and seeing them as parents was awesome! I don’t want to go into the story because I feel like I would spoil it. I will say that Barb’s writing gets more crisp with each book she writes. I have read all of her books and without a doubt, this series is one of my forever favorites!